OK ... I'll take 4. 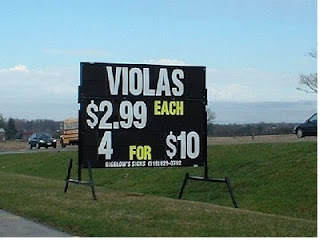 One of our viola players at orchestra might be able to use some spares; she's dropped hers a few times. Boy is that tempting. It would be neat to have a few spares incase something happens to one of them. I will need to look into the possibility. Thank you for showing it to me. of course I know it is probably the plant, but still a spare or 2 of the instrament would be nice to have. You know different sounds, for different types of music.